It has been a long time since I have written a book review, and, as the gap grows, it gets all the more difficult. This review is an attempt to break that jinx and get back to talking about books, which are, what I love the most! 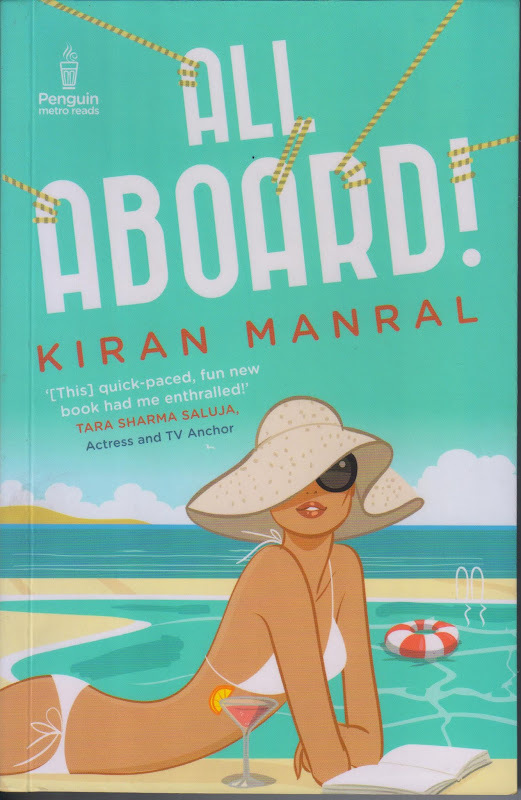 As you already know from the title, this post is about Kiran Manral’s All Aboard, a light romance, telling us the story of Rhea, recuperating from a heartbreak, and Kamal, the hotshot entrepreneur. They meet aboard the Aqua Princess, a Mediterranean Cruise liner, and as the cruise progresses, their mutual attraction does too. The novel is fast paced, with all the elements needed to make it a success – there are misunderstandings, clash of egos, another romance on the side, exes who suddenly turn up to complicate matters, and even a criminal to whip things up and make it more interesting! Kiran’s narrative is as easy as ever, the language excellent, without being highbrow. I have been reading Kiran’s blogs for years now, and her books have the same sense of innate humor, which make them such a good read. When I met Kiran recently over a lunch she hosted, everyone had the same question – had she actually been on a cruise before she wrote the book? It was a reasonable question, and, it is only when you read the book, that you realize just how impressive her research has been, that she has written about the cruise in such amazing detail, without ever being on one! I haven’t been on one either, but her descriptions of the rooms, of the cruise experience, of the sites they stop at, are so realistic and well written, I found myself wondering if I could ever write about a place so well, without actually going there! Overall, All Aboard is the kind of book I pick up when I am between books, and want a good, but easy read, to help me relax. Meanwhile, I am looking forward to her next book - Karmic Kids - the story of parenting nobody told you! - which is based on her blog… the one I have been reading for years, even before I met her! P.S. I received a review copy of the book from the author, but the views expressed are entirely my own. Thank you for the kind words, Anuradha. I was in two minds to buy and read this book.